The list of cut off marks was released on Thursday for the academic session 2016-17. This time, the DU has received over 2.5 lakh applications which will start right from the Friday. 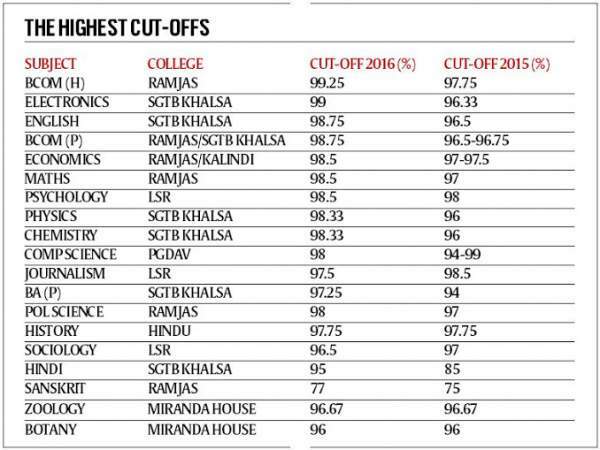 Ramjas College has announced the highest cut-off among the DU colleges. Miranda House has kept its cut off as 97.75 per cent for Economics Honors. It is same for science courses as it was in 2015. Lady Sri Ram College has declared its Psychology cut-off as 98.50%, English 98.25%, Economics 98%, and Commerce (H) at 98 percent. For the first time in the entire history, the Delhi University has introduced completely online admission procedure for UG admissions. Earlier, it was both online and offline mode. This year, the online registration process will start on June 1 to until June 22. Sri Guru Teg Bahadur Khalsa College has set B.Sc. Electronics cutoff at 99 percent. Moreover, students can also check the cut offs online on the website. If they meet the eligibility, they can log into the admission portal of the university on their website. Then, they will have to choose the rquired college and course. After filling the online form, the candidates will need to take the print out along with all the listed documents and their self attested copies. Thereafter, they will be required to go to the designated college on any of three days of admission. But, this is the very first time when the university has seen a drop in the number of applications. There is a dip of about 40,000 applicants this year. Last year, it was a total of 2,91,819 while this year, it has been only 2,50,914 for the total of 54,000 seats in 63 colleges. Out of these 2,50,914 applicants, there are a total of 1,30,354 are male while 1,20,545 are female candidates. There are 15 applications in others category. But, this year saw an increase in the number of disable category. There are 1,187 applicants for the disabled category. This is the first time when the university has made sports and ECA category application centralized and online. 10,382 and 8,273 applications have come for the sports and the ECA quota respectively. Each college has a maximum of 5% quota in the category. Moreover, the applications under the Children of War Widows and Kashmiri migrant quota also filled the centralised form. There were just 430 applicants under Kashmiri quota. Under the Defence Category (CW) there are 318 applications. The university reserves 5 per cent each under the category.